Version 2.1 — Requires macOS 10.10 or later. View, search, edit, import, export, build, configure, and monitor your MySQL and MariaDB databases easier than ever before. With Querious, you can even open up raw CSV or Tab files and easily split, join, reorder, add, remove, and process columns and rows, and then convert the whole file to another format in a snap. 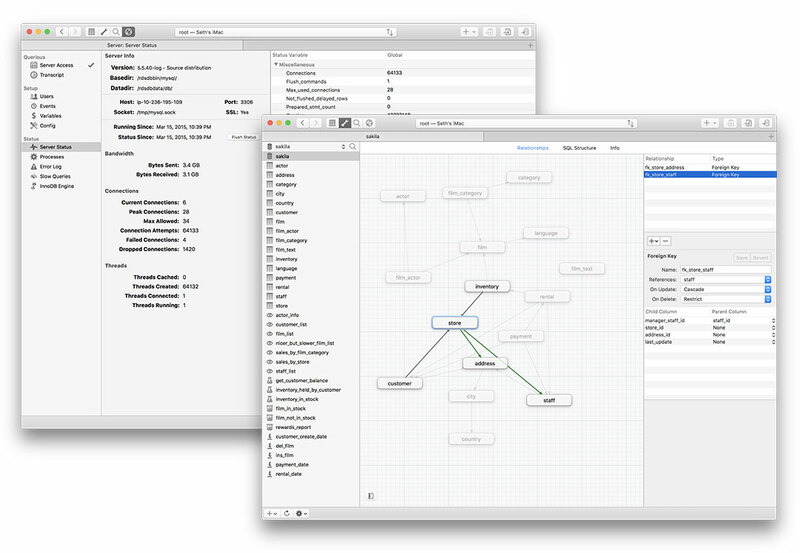 Querious 2 makes working with your databases even easier. With hundreds of new features and improvements over version 1, and an extensive beta period, no stone was left unturned when enhancing every aspect of the work you need to do. From the full support for events, triggers, functions, procedures, and views, the server error log, slow queries, server status, and query transcripts, all the way to the fastest importing and exporting on macOS, Querious 2 has covered it all. And it's getting better all the time. It begins with a solid foundation. Viewing and editing table content with Querious is a breeze. The Content view is packed full of convenient features, such as a flexible multiple-condition filter, easy multi-row value assignment, row duplication, copying to the clipboard, and jumping to related tables through foreign keys. You can even use the multi-condition filter controls to select just the right rows, right-click and select "Copy SELECT Statement" to get the SQL query to perform that exact same search. Fewer queries means greater efficiency. Querious has complete interfaces for defining and editing table columns, indexes, primary and foreign keys, triggers, events, functions, and procedures. The straightforward and uncluttered editors allow you to quickly see and change the structure make-up of your databases. Unlike other programs which simply show the raw table contents that define each of these schema object types, Querious shows them logically, so you don't have to have a master's degree in the internal organization of MySQL. It literally doesn't get any better. 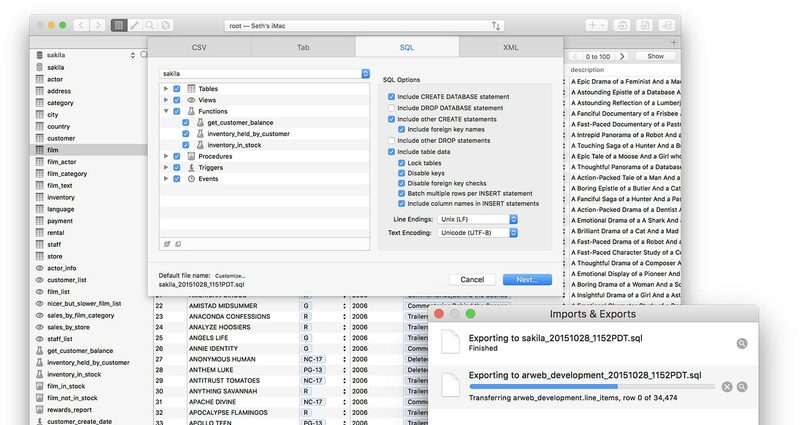 Querious can import and export data using SQL, CSV, and Tab files, allowing fine-tuned adjustments to adapt to any slight format differences between programs. 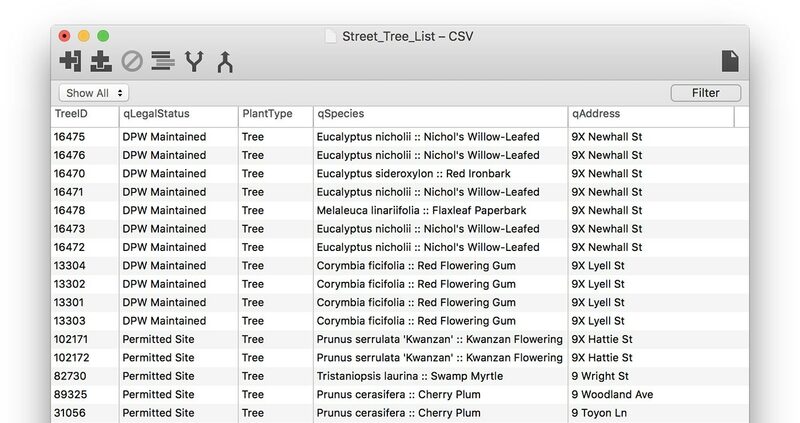 Querious also has a unique interface for mapping columns in CSV and Tab files to columns in your database tables, so you can selectively import or export specific columns. Not only can Querious do speedy imports and exports, but it can also "duplicate" views, triggers, functions, procedures, events, and even tables including their data content, within the same database, between databases on the same server, or between completely different servers! What's even more impressive is Querious can duplicate an entire database, even between servers. We hate waiting, and we know you do too. That's why we obsessed over shaving off every last microsecond wherever we could. For example, when it comes to importing and exporting data, nothing is faster than Querious. The only reason to use anything besides Querious is if you actually like waiting for super-long exports. Results from exporting 2 million rows of forum posts on a local machine. Use the Query view when you need to perform custom joins, subselects, run alter statements manually, or any other kind of query. Take advantage of the detailed syntax coloring and fast autocomplete to get the job done. Why type the same queries over and over? Querious lets you store and organize queries right inside of the Query view. You can even manage your own custom nested folders of queries and place them in the Favorites bar for the quickest access to your queries. There are main tasks when using a database: 1. Setting up the structure, 2. Viewing and manipulating data, and 3. Managing the database server itself. For some reason, many apps forget about that last one. Querious goes beyond just helping you manage the data in your tables enabling you to quickly see the status of the server, such as bandwidth used, number of connections, and see the queries/processes running on the server. You can also setup and administer user permissions, the event scheduler, server variables, and when file system access is authorized (via SSH for remote hosts), Querious can even display the errors and slow queries logged on the server. When working with a new database or resuming work with one you haven't used in a long time, sometimes you need a high level overview of how your tables are related to each other, and the keys which establish those relationships. 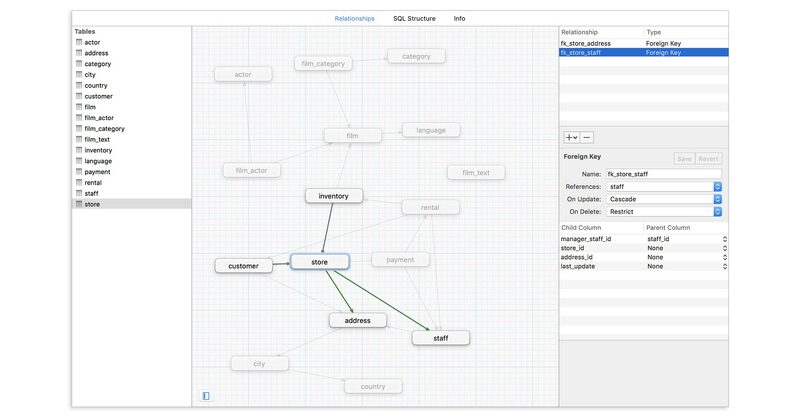 The Relationships view gives you that quick understanding, showing you the foreign keys connecting tables together. But Querious even goes a step further. Not all database engines, such as MyISAM, actually support foriegn keys. Not all relationships between tables are necessarily mapped out explicitly with foreign keys either. This is where Artificial Foreign Keys come in. Only in Querious can you specify "artificial" keys which relate two tables. Querious will then use those added relationships to offer extra features in the Table Content view, such as the in-cell Jump buttons to jump to a referenced row in another table, and the rich "Show Related Rows" panel. Edit CSV and Tab files easier than ever. Querious has a powerful built-in editor for directly editing CSV and Tab files like a spreadsheet. If a client gives you a CSV file with wacky columns or malformed data, you can easily clean it up Querious. Need to apply a regular expression replacement to all or just one column? You can! Need to join multiple columns together? Not a problem! Need to split a single column into multiple columns? That's no problem either! Not only can you easily manipulate the add, filter, and massage the data in the files, but converting between CSV/Tab format varitions is a cinch. Data security is a top priority and that's why Querious supports direct connections to MySQL over encrypted SSL channels, and also through SSH tunnels using password or key authentication right out of the box. MySQL user passwords are saved in your Apple Keychain. Safe, secure, and convenient. Not only can you easily setup and use your database tables, but you can also create and tweak triggers, functions, procedures, views, and events with full visual editors. No more hassling with SQL; Get it done quick and painlessly with Querious. Managing user privileges "by hand" can be a pain. With Querious, you can effortlessly see and understand the privileges set for each user. Add and remove database-, table-, and even column-level privileges by simply clicking on checkboxes.